Bring the essence of your favorite fall drink into the shower with this spiced pumpkin latte sugar scrub project. 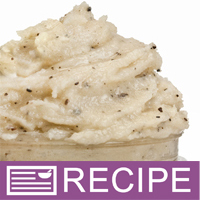 This is a luxury sugar scrub suitable for your fall product line! White granulated sugar and poppy seeds gently exfoliate while the coffee butter, almond butter and coconut oil leave your skin smooth and moisturized. It smells just like a spiced pumpkin latte with the blend of Spiced Pumpkin Fragrance Oil and Coffee Bar Fragrance Oil. You may need a warning statement about not eating it because it smells so delicious! COMMENTS: This was a high success at my fall/winter markets. Sold out of all jars made. "Hard to Make a Profit"
COMMENTS: I bought this kit when it was 50% off. Even at this price, I think this product is difficult to make a profit from. The jars are very small and its difficult to charge enough and have people want to purchase such a small jar. I don't know who would pay the recommended $13 for a jar this small. The scent is awesome and the end product looks great. The instructions were easy to follow, however mine had an error in the body of the instructions regarding how much Vitamin E to add. Make sure to whip the product long enough that the butter starts to solidify again before packaging to avoid the oil leakage some other reviewers saw. I'd love to see WSP include labels with their kits. This product was a mild exfoliant that left a non-heavy moisture behind. COMMENTS: I have made several types of body scrubs and this is definitely a nice addition to my product line. It doesn't foam or get soapy which is a nice change. It gently exfoliates the skin and there's no need to apply lotion afterward! I did add extra coffee grounds in the 2nd batch to have a bit more exfoliation for my legs. The smell is AMAZING! I love the fragrances that come with this kit. • The fragrances are divine! • Lots of supplies left! COMMENTS: This is the second kit that I bought to try out a scrub recipe. The smell is amazing!! My daughter and I starter a small at home business and these kits are perfect. It comes with everything you need to make this recipe. We like the fact that it makes a few jars. This way we can sell at a craft fair to see if it is a product we should invest in or not.This way we are not spending a lot of money on the ingredients needed to make it and it doesn't sell. It smells and works amazing. I feel like a lil pro. It smells so good you really do want to eat it! I know this product will not disappoint us at the craft fair. • make this recipe. EVERYTHING!!! • I was so pleased with the outcome! COMMENTS: The smell and texture is nice and it was easy enough to make. The issue I have with the kit is that it should include the press and seal liners. I noticed that the oils will leak out of the container which is not good for selling. I will now need to wait for the liners to be back in stock before I attempt to sell the finished product. • Needs to include press & seal liners. "Excellent product but hard to make a profit." COMMENTS: When I was choosing products for my line, I bought this kit just a a trial. It is amazing. My customers love it and want more. The problem is, it is hard to make a profit on it. I wasn't expecting to make a profit on the kit, but even purchasing in larger quantities, it is expensive to make. So 5 starts for the product and recipe, 3 stars for cost of the product. If you are making for gifts, it is perfect. If you want to resell it, you can make more money elsewhere. COMMENTS: I purchased this item based on the 2 reviews on it from previous customers. It was easy to make and feels and smells phenomenal. The issue I have with it is that it oozes out of the packaging. I changed containers and quantity more than once as well as cleaned the lip of the containers to see if it would stop oozing, but it didn't. I will not be purchasing this item again because of this issue. I purchased it for retail purposes and cannot sell any of the 5 kits I purchased and assembled of this product. For me this is a total loss. "Spiced Pumpkin Latter Sugar Scrub Kit"
COMMENTS: I love this kit. The coffee butter blend smells absolutely delicious. I love the fragrances in this kit. They are absolutely wonderful, my kitchen smelled so amazing. I love this kit it was easy enough to follow and the directions were simple and straight forward. My 12 year old daughter and I made this together. I loved how all the product came together and we even learned something about putting poppy seed in there very awesome. We loved the feel of the products, it's a wonderful product and we will purchase more products from wholesale plus in the near future. The only thing I disliked about the kit as it just didn't seem to make enough. However, the kit did fill all 4 jars that we received so I was very happy and pleased with that as I didn't feel short or cheated. COMMENTS: Ok, made this spiced pumpkin latte sugar scrub from the kit. Was really easy to make, and you even have left over fragrance! This smells SO good, good enough to eat! laugh Everyone I've sold it to loves it, and says, oh man, I could eat this! Only thing I wish is that the kit made more than 4 jars! Will buy again next fall-definite big seller, but need MORE! • Make a larger kit!